Lambeau Field has been the home to the Green bay Packers since 1956. Recently the most dramatic and extensive renovation occurred, making Lambeau Field one of the finest stadiums in the world. Carew Concrete is extremely proud to have been the ready mix supplier for the renovation project, supplying 99.9% of the concrete used - over 70,000 yards of concrete. With a 1,695,500 square foot complex that has seating for 72,515 people, this was one large project, with many challenges. Finishing the stadium in the off-season meant that a great deal of concrete had to be placed at temperatures below freezing. Another big challenge was getting enough lightweight stone pre-soaked to keep up with the volume demand. Quality control was very important; we monitored it daily and had two technicians on site for every pour. With multiple contractors, at times there were more than four concrete pours going on at once. Through our experience and expertise we were able to meet any challenge that faced us. The project logged 2.4 million work hours and kept 283 companies very busy, ultimately keeping many people in the community working. 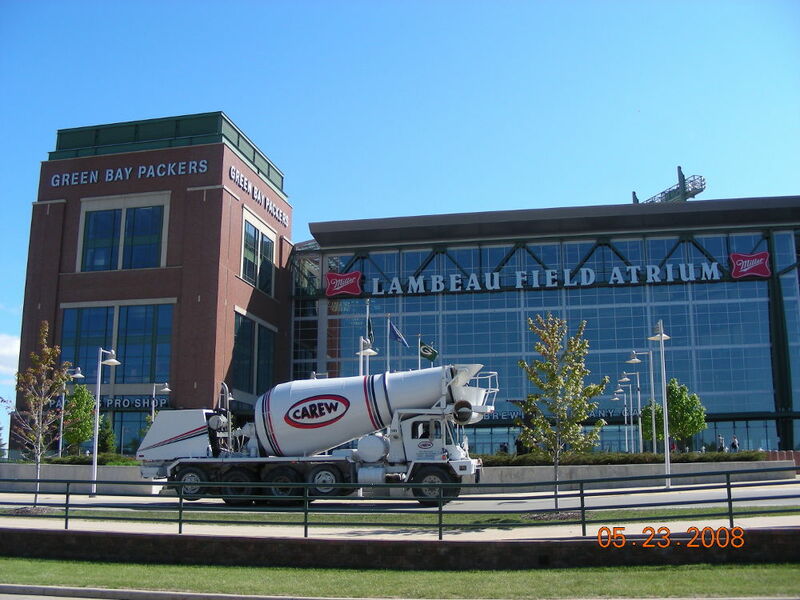 Carew Concrete is extremely honored to have been a part of the Lambeau renovation. Packer fans will enjoy this beautiful stadium for years to come – the legend lives on.